CombiS-BP Editor is an extension of OPBUS 1.0. In addition to OPBUS features, CombiS-BP Editor enables to combine an imperative and declarative specification of a business process. CombiS-BP Editor makes possible to include BPMN 2.0 components in an imperative way by means of using a declarative element, called CombA Sub-Process. CombiS-BP Editor integrates a BPMN 2.0 modeller that also enables the creation of CombA Sub-Process. The user interface is composed of four main parts: edition zone, palette, properties and problem tabs, and a project workspace zone with basic menus. Business experts model the common BP in the edition zone. In this part, declarative and imperative specifications are differentiated through the different elements used in the process. 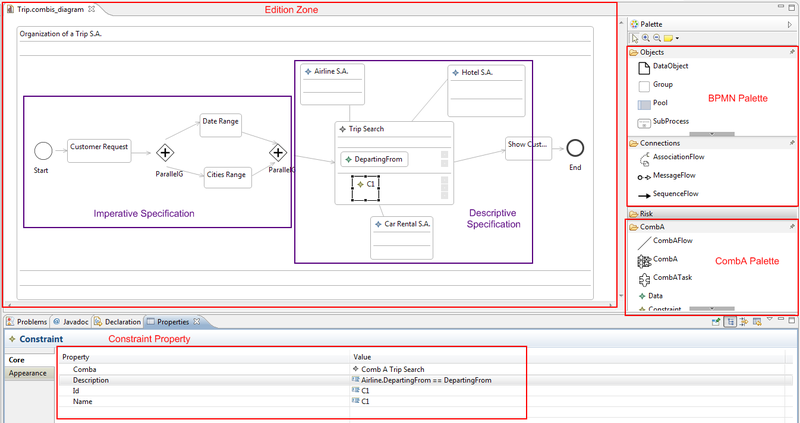 The palette provides the graphical definition of BPMN elements (imperative specification) and CombA (declarative specification), which can be selected and dropped into the edition zone. The marker associated to CombA Sub-Process graphical definition in the palette is a set of puzzle pieces symbol, and to CombA Task (activities involved in the combination), the graphical definition is a unique puzzle piece symbol. CombA Flow is a solid line that can connect only CambATask with CombA Sub-Process. The declarative definition is completed with the properties part, which provides support for the definition of elements details. A demo of some actions of CombiS-BP Editor is available here.